The magnetic resonator piano brings continuous note shaping to the acoustic piano. The magnetic resonator piano (MRP) is an electronically-augmented acoustic piano capable of eliciting new sounds acoustically from the piano strings, without speakers. Electromagnets induce vibrations in the strings independently of the hammers, creating infinite sustain, crescendos, harmonics, pitch beends and new timbres, all controlled from the piano keyboard. The MRP installs in any grand piano and has been used in compositions, performances and recordings internationally. The MRP was initially designed as an extension of the piano, allowing the player to continuously shape each note in dynamics, pitch and timbre, while retaining the richness and nuance of the acoustic grand piano. The MRP also unlocks a sound world far removed from the traditional piano. When the keys are played lightly and no hammers strike the strings, the electromagnets elicit sustained, subtly evolving tones which have many of the acoustic qualities of the piano, including the sympathetic resonance between strings, but without the familiar percussion. It is also possible to explore the space “between the notes” by bending notes away from where the strings are tuned and exploring the harmonics of each string. The results of this mode of playing have been explored in compositions and gallery installations. 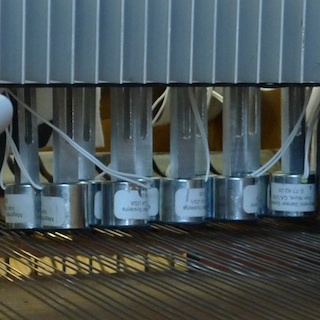 Electromagnets are placed just above the piano strings on adjustable brackets. Piano strings are made of steel, which is a ferromagnetic material, meaning it can be attracted by a magnetic field. 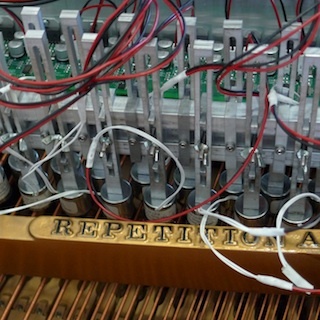 The MRP uses 88 electromagnetic actuators to cover the complete range of the piano (one actuator per note, though a note may include 2 or 3 identically-tuned strings). When current is passed through an actuator, the string is pulled upward; when the current is turned off, the string returns to its original position. By modulating the current at the frequency of the string or one of its harmonics, the string is made to vibrate sympathetically without ever having been struck by the hammer. Amplifier board for 18 notes. 5 boards cover the complete range of the piano. Audio signals for the electromagnets ultimately come from a computer, controlled by the performer’s actions at the keyboard. One amplifier per actuator is used to achieve the necessary power level. The current instrument is capable of up to 20W per string for short time, limited by the heating of the magnets. The tones produced can be quite loud, especially in the middle and treble registers, comparable in sound pressure level to forte playing on the traditional piano. A wide dynamic range is possible which also includes tones barely above silence. The instrument covers 88 strings, but requiring 88 audio channels would be prohibitive. The amplifier circuitry therefore includes a signal routing system where audio channels are dynamically allocated to each string as needed. A standard audio interface can be used, with the number of audio channels (up to 16) determining the maximum polyphony of the instrument. In practice, the instrument is often run with 6-to-10-note polyphony. The tuning of each piano varies slightly, and the best performance is obtained when the actuator frequencies exactly match the tuning of the strings, with the bass notes being particularly sensitive to tuning accuracy. To adjust to the tuning of the specific piano, a pickup can be placed on the soundboard and a phased-locked loop (PLL) system used to lock the actuators into the existing vibrations of the strings. More detail on this process can be found in this paper. A. McPherson. 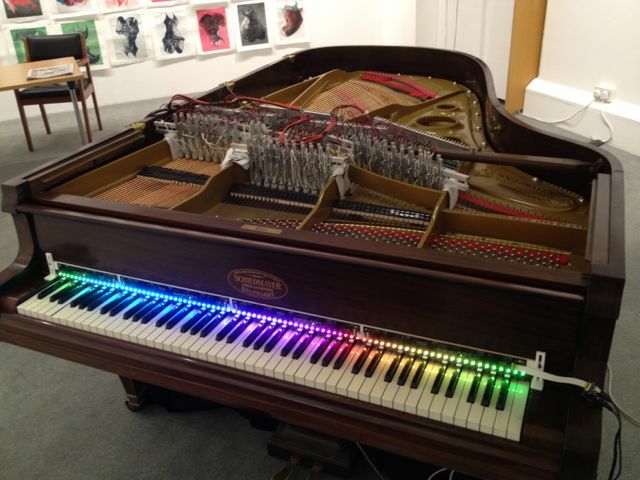 The magnetic resonator piano: electronic augmentation of an acoustic grand piano. Journal of New Music Research 2010, 39 (3), 189-202. The MRP in an art gallery in Aberystwyth as part of the show Beyond the Moon by printmaker Wuon-Gean Ho. The scanner bar with multicoloured LED feedback can be seen on the keyboard. Continuous control of every note is a primary goal of the MRP, whether it is used to subtly extend the sounds of the traditional piano or to create novel and unusual effects. MIDI keyboards represent notes solely by onset and release, and even where aftertouch is used, the degree of control is insufficient for the continuously-evolving MRP sounds. Instead, a custom optical scanner bar is placed on the piano keyboard which records the continuous angle of each key. Close-up of scanner on keyboard. Optical reflectance sensors use LED and phototransistor in a single package. Continuous key data can be used to capture the subtle details of how a key has been pressed, including dimensions beyond velocity. More information on these measurements can be found in this paper. Continuous key angle also allows new techniques including partial key presses, light taps on the surface, vibrato and aFtertouch on the acoustic piano (since the keybed is lined in felt, which compresses under pressure). A computer maps key angle to actuator behaviour in a manner designed to be intuitive for the performer. The pianist does not interact with the computer during the normal performance process, though it is possible for certain aspects of the mappings to be dynamically changed by the pianist or another person. The standard mapping uses key angle to affect the volume of a note, such that a slow key press will produce a crescendo from silence. Pressure on a key will change the timbre of a note, and rhythmic oscillation in key pressure will produce a vibrato effect. Lightly, repeatedly tapping the surface of the key produces a glissando up the harmonic series of the note, creating a shimmering effect. When one key is held and a neighbouring key is lightly pressed, the pitch can be bent up or down. Each of these effects is demonstrated in the video at the top of this page. A. McPherson and Y. Kim. Augmenting the acoustic piano with electromagnetic string actuation and continuous key position sensing. Proc. New Interfaces for Musical Expression, Sydney, Australia, 2010. A. McPherson and Y. Kim. Multidimensional gesture sensing at the piano keyboard. Proc. ACM Conference on Human Factors in Computing Systems (CHI), Vancouver, BC, Canada, 2011. A. McPherson. Portable measurement and mapping of continuous piano gesture. Proc. New Interfaces for Musical Expression, Seoul, South Korea, 2013. The MRP has been used in new pieces and recordings by a growing number of composers and performers. Since it can be set up in any grand piano and fits in travel-sized cases, new pieces can be performed anywhere. Scores and recordings are available from the composers in most cases; contact Andrew McPherson if you are interested. The repertoire for the MRP has grown steadily since the instrument was first created in 2009. A 2011 collaboration with Philadelphia composers and performers is described in this article in Computer Music Journal. In 2013, the MRP has been featured by the London Chamber Orchestra as part of the project “LCO New: Inspired by Digital”. Many other composers and pianists have since used it in projects including classical compositions, jazz and rock albums, film scores and free improvisations. Andrew McPherson, d’Amore (2009), 11’, for viola and MRP. Performances by Nadia Sirota, Bridget Carey and Rachel Ku. Commercially released on Innova Recordings. Andrew McPherson, Layers Deep Below (2011), 8’. Premiere by Andrew McPherson. David Carpenter, Job (2011), 13’, for baritone voice and MRP. Premiere by Lawrence Indik and Feifei Zhang. William Derganc, Play (2011), 6’, for violin and MRP. Premiere by Noco Kawamura and Matt Bengtson. Jeff Snyder, Fantasy (2011), 10’. Performances by Eric Wubbels and Lola Perrin. William Dougherty, Emanations (2013), for violin, viola, cello, bass and MRP. Premiered by members of London Chamber Orchestra at Cadogan Hall, 17 May 2013. Pedro Faria Gomes, tereza’s dreams (2013), for 8-piece ensemble including MRP. Premiered by members of London Chamber Orchestra at Cadogan Hall, 17 May 2013. James Moriarty, Untempered by the Hand of Man (2013), for 5-piece ensemble including MRP. Premiered by members of London Chamber Orchestra at Cadogan Hall, 17 May 2013. Nick Morrish Rarity and Tim Morrish, Impulse.Pulse.Parted (2013), for 8-piece ensemble including MRP. Premiered by members of London Chamber Orchestra at Cadogan Hall, 17 May 2013. Andrew Thomas, Till Human Voices Wake Us (2013), for 6-piece ensemble including MRP. Premiered by members of London Chamber Orchestra at Cadogan Hall, 17 May 2013. Richard Peat, You leave it with me (2014), for magnetic resonator piano. Premiered by Neil Georgeson, QMUL, 25 October 2014. Ben Parker, Time Stopped and Snow Fell (2015). for magnetic resonator piano. Premiered by Ben Powell, Royal Northern College of Music (UK), 22 March 2015. Sergio Cote, piece for magnetic resonator piano (2015). Premiered by Leanne Cody, Royal Northern College of Music (UK), 22 March 2015. Oded Ben-Tal, Sonata (Scarlatti, Schubert, Scriabin) (2016), for magnetic resonator piano and live electronics. Premiered by Elaine Chew, Schott Music London, 24 June 2016. Jonathan Pitkin, l.v. (2017), for magnetic resonator piano. Premiered by Kate Ryder at the Royal College of Music on 23 November 2017. The magnetic resonator piano will be featured in an upcoming album by the jazz pianist Kuba Pluzek to be released in 2019. The recording took place December 2018 on a Boesendorfer 225 piano at Snap Studios in north London. The magnetic resonator piano is featured in the album Field of Reeds by These New Puritans, released April 2013. The recording took place December 2012 on a Boesendorfer 225 piano at Snap Studios in north London. E. I. Dolan. Portrait: Andrew McPherson and the Magnetic Resonator Piano. Keyboard Perspectives VIII, 2015.